Disrupted serotonergic neurotransmission has long been implicated in major depressive disorder (MDD), for which selective serotonin reuptake inhibitors (SSRIs) are the first line of treatment. However, a significant percentage of patients remain SSRI-resistant and it is unclear whether and how alterations in serotonergic neurons contribute to SSRI resistance in these patients. Induced pluripotent stem cells (iPSCs) facilitate the study of patient-specific neural subtypes that are typically inaccessible in living patients, enabling the discovery of disease-related phenotypes. In our study of a well-characterized cohort of over 800 MDD patients, we generated iPSCs and serotonergic neurons from three extreme SSRI-remitters (R) and SSRI-nonremitters (NR). We studied serotonin (5-HT) biochemistry and observed no significant differences in 5-HT release and reuptake or in genes related to 5-HT biochemistry. 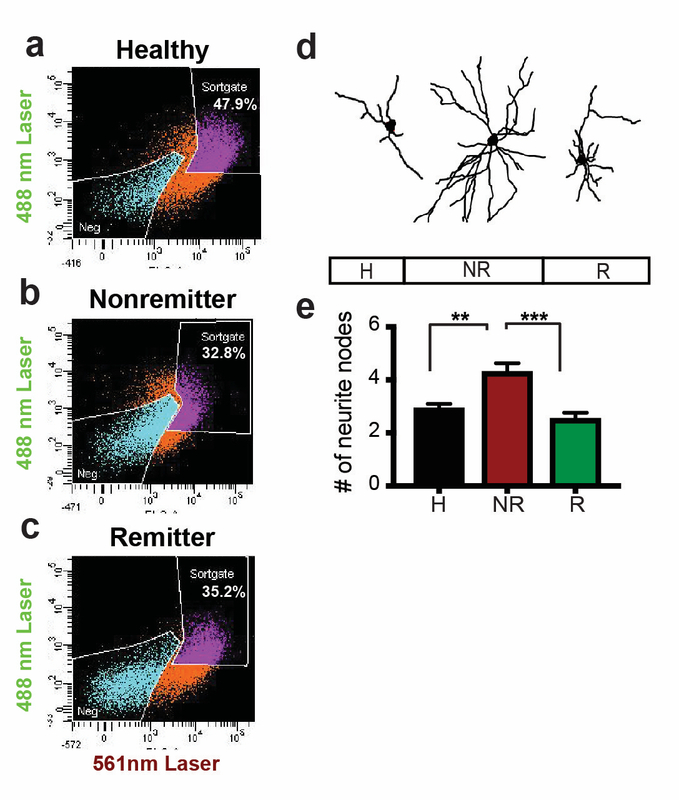 NR patient-derived serotonergic neurons exhibited altered neurite growth and morphology downstream of lowered expression of key Protocadherin alpha genes as compared to healthy controls and Rs. Furthermore, knockdown of Protocadherin alpha genes directly regulated iPSC-derived neurite length and morphology. Our results suggest that intrinsic differences in serotonergic neuron morphology and the resulting circuitry may contribute to SSRI resistance in MDD patients. Rush AJ, et al. Acute and longer-term outcomes in depressed outpatients requiring one or several treatment steps: a STAR*D report. Am J Psychiatry. 2006;163:1905–17. Levinstein MR, Samuels BA. Mechanisms underlying the antidepressant response and treatment resistance. Front Behav Neurosci. 2014;8:208. Andersen J, et al. Mutational mapping and modeling of the binding site for (S)-citalopram in the human serotonin transporter. J Biol Chem. 2010;285:2051–63. Smith KA, Fairburn CG, Cowen PJ. Relapse of depression after rapid depletion of tryptophan. Lancet. 1997;349:915–9. Sharp T, Cowen PJ. 5-HT and depression: is the glass half-full? Curr Opin Pharmacol. 2011;11:45–51. Cowen PJ. Serotonin and depression: pathophysiological mechanism or marketing myth? Trends Pharmacol Sci. 2008;29:433–6. Vadodaria KC, Stern S, Marchetto MC, Gage FH. Serotonin in psychiatry: in vitro disease modeling using patient-derived neurons. Cell Tissue Res. 2018;371:161–70. Baker KG, Halliday GM, Tork I. Cytoarchitecture of the human dorsal raphe nucleus. J Comp Neurol. 1990;301:147–61. Wray NR & Sullivan PF. Genome-wide association analyses identify 44 risk variants and refine the genetic architecture of major depression. Nat Genet. 2018;50:668–81. Soliman MA, Aboharb F, Zeltner N, Studer L. Pluripotent stem cells in neuropsychiatric disorders. Mol Psychiatry. 2017;22:1241–9. Brennand KJ, et al. Modelling schizophrenia using human induced pluripotent stem cells. Nature. 2011;473:221–5. Mertens J, et al. Differential responses to lithium in hyperexcitable neurons from patients with bipolar disorder. Nature. 2015;527:95–99. Marchetto MC, et al. Altered proliferation and networks in neural cells derived from idiopathic autistic individuals. Mol Psychiatry. 2017;22:820–35. Yoon KJ, et al. Modeling a genetic risk for schizophrenia in iPSCs and mice reveals neural stem cell deficits associated with adherens junctions and polarity. Cell stem Cell. 2014;15:79–91. Madison JM, et al. Characterization of bipolar disorder patient-specific induced pluripotent stem cells from a family reveals neurodevelopmental and mRNA expression abnormalities. Mol Psychiatry. 2015;20:703–17. Robicsek O, et al. Abnormal neuronal differentiation and mitochondrial dysfunction in hair follicle-derived induced pluripotent stem cells of schizophrenia patients. Mol Psychiatry. 2013;18:1067–76. Mrazek DA, et al. Treatment outcomes of depression: the pharmacogenomic research network antidepressant medication pharmacogenomic study. J Clin Psychopharmacol. 2014;34:313–7. Vadodaria KC, Marchetto MC, Mertens J, Gage FH. Generating human serotonergic neurons in vitro: methodological advances. Bioessay News Rev Mol Cell Dev Biol. 2016;38:1123–9. Vadodaria KC, et al. Generation of functional human serotonergic neurons from fibroblasts. Mol Psychiatry. 2016;21:49–61. Kiyasova V, Gaspar P. Development of raphe serotonin neurons from specification to guidance. Eur J Neurosci. 2011;34:1553–62. Albert PR, Vahid-Ansari F, Luckhart C. Serotonin-prefrontal cortical circuitry in anxiety and depression phenotypes: pivotal role of pre- and post-synaptic 5-HT1A receptor expression. Front Behav Neurosci. 2014;8:199. Sundstrom E, et al. Neurochemical differentiation of human bulbospinal monoaminergic neurons during the first trimester. brain Res Dev brain Res. 1993;75:1–12. Katori S, et al. Protocadherin-alpha family is required for serotonergic projections to appropriately innervate target brain areas. J Neurosci. 2009;29:9137–47. Chen WV, et al. 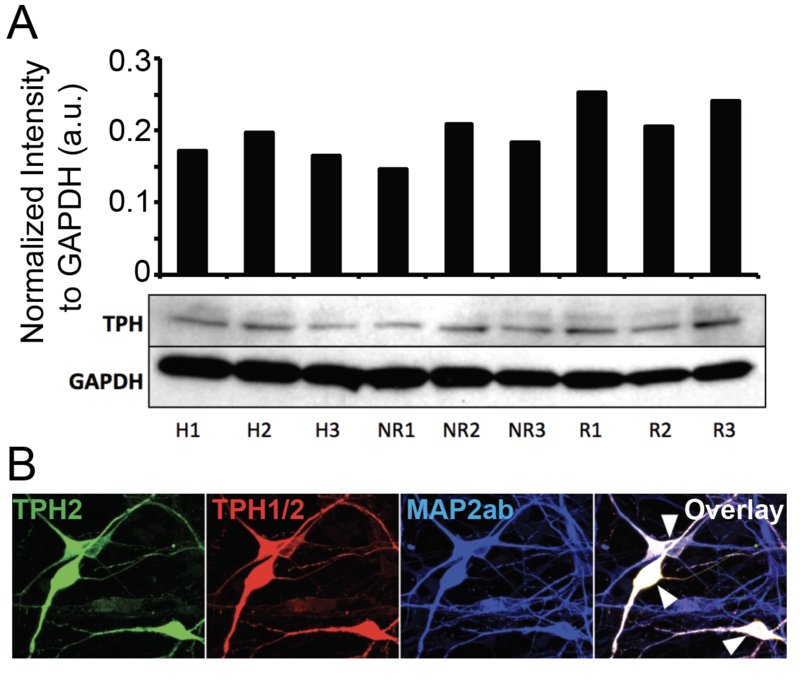 Pcdhalphac2 is required for axonal tiling and assembly of serotonergic circuitries in mice. Science. 2017;356:406–11. Keeler AB, Molumby MJ, Weiner JA. Protocadherins branch out: Multiple roles in dendrite development. Cell Adh Migr. 2015;9:214–26. Vadodaria KC, Amatya DN, Marchetto MC, Gage FH. Modeling psychiatric disorders using patient stem cell-derived neurons: a way forward. Genome Med. 2018;10:1. Albert PR, Benkelfat C, Descarries L. The neurobiology of depression--revisiting the serotonin hypothesis. I. Cellular and molecular mechanisms. Philos Trans R Soc Lond Ser B Biol Sci. 2012;367:2378–81. Rush AJ, et al. An evaluation of the quick inventory of depressive symptomatology and the hamilton rating scale for depression: a sequenced treatment alternatives to relieve depression trial report. Biol Psychiatry. 2006;59:493–501. Lu J, et al. Generation of serotonin neurons from human pluripotent stem cells. Nat Biotechnol. 2016;34:89–94. Dobin A, et al. 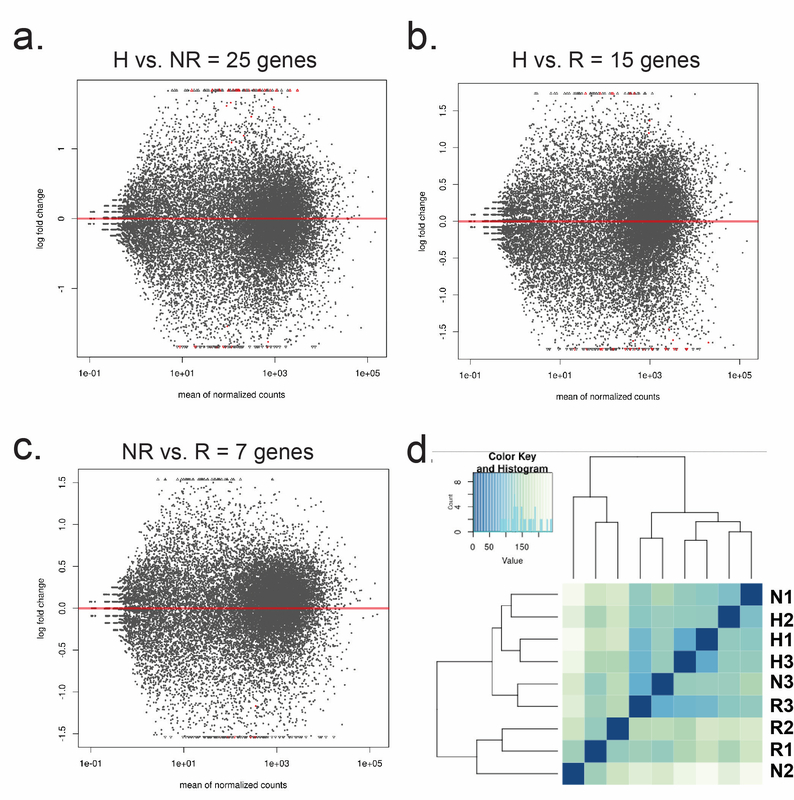 STAR: ultrafast universal RNA-seq aligner. Bioinformatics. 2013;29:15–21. Liao Y, Smyth GK, Shi W. FeatureCounts: an efficient general purpose program for assigning sequence reads to genomic features. Bioinformatics. 2014;30:923–30. Anders S, Huber W. Differential expression analysis for sequence count data. Genome Biol. 2010;11:R106. This research was supported by the Robert and Mary Jane Engman Foundation, Lynn and Edward Streim, and a Takeda-Sanford Consortium Innovation Alliance grant program (Takeda Pharmaceutical Company). KCV was supported by the Swiss National Science Foundation (SNSF) outgoing postdoctoral fellowship. Patient enrollment and iPSC generation were funded by the Minnesota Partnership Award for Biotechnology and Medical Genomics (YJ) and the 2012 Mayo Clinic Center for Regenerative Medicine (YJ). YJ was supported by the NIH-Mayo Clinic KL2 Mentored Career Development Award (NCAT UL1TR000135) and the Gerstner Family Mayo Career Development Award in Individualized Medicine. Patient recruitment and the laboratory aspects of the clinical trial were funded by NIH U19 GM61388 (PGRN) and NIH RO1 GM28157. The authors would also like to acknowledge the staff and investigators of the PGRN-AMPS study for their contributions, particularly the late Dr. David A. Mrazek, the former Principal Investigator of the PGRN-AMPS study within the Mayo Clinic NIH-PGRN (U19 GM61388). This research would not have been possible without Dr. Mrazek’s pioneering vision and dedication to antidepressant pharmacogenomics research. We also thank Dr. Manching Ku for help with RNA sequencing and ML Gage for editorial comments on the manuscript. Correspondence to Fred H. Gage.